Supplied as jumbo plug plants, can be planted sraight in the garden - April to September. 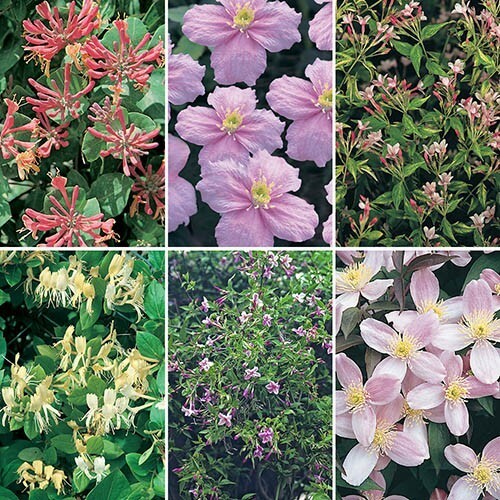 The complete Climbing Plant collection is the easy way to cover unsightly objects and add colour to your garden all year long with this fantastic collection of climbers! Perfect for brightening up bare walls, banks, sheds, carports, pergolas or growing on trellises, each of these tough and vigorous plants will come alive each year between late spring and autumn, bursting with a range of pinks, purples and yellow flowers. Not only that, these climbers will fill your garden with delightful sweet scent! Hardy, they will come back year after year, yet are easy to manage, simply cut back to size or trim each Autumn. Note - contents may vary in season, you will get 5 of these listed in each collection though. Supplied as jumbo plugs (2.5 - 3.5cm diameter), 1 each of the varieties listed. Plant straight into garden in Spring, but we suggest potting on for a Month or so in Autumn.